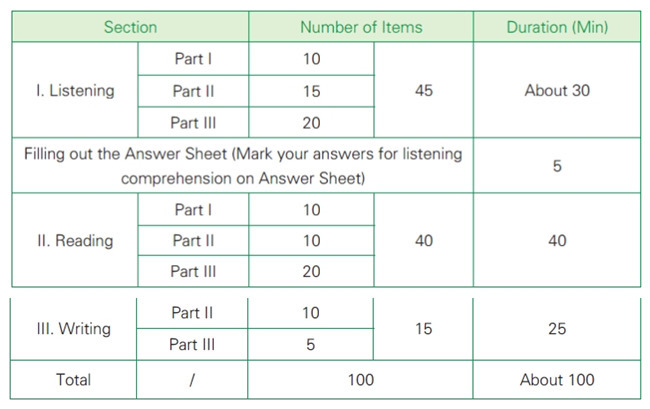 The Level 4 HSK exam includes writing, reading, and listening sections. Pinyin does not accompany the characters in the test. Students may take the test online or they may opt for the handwritten version. Prior to beginning to study for this exam, you should have an understanding of the rules and test format of the Level 4 HSK exam; these are described in the next paragraph. Test takers who are able to pass the HSK (Level IV) can converse in Chinese on a wide range of topics and are able to communicate fluently with native Chinese speakers. Test takers will acquire 1200 Chinese characters and master HSK Level 4 related grammar. HSK (Level IV) test is made up of listening comprehension, reading comprehension and writing sections and contains 100 test items. Part I contains 10 items. Test takers will listen to each item only once. For each item, one person says a short paragraph and the other person will say a sentence based on the paragraph. The sentence is also given on the test paper, and test takers should judge if the content of the sentence is right or wrong. should select the right answer based on what he/she has heard. Part II contains 10 items. For each item, 3 sentences will be given and test takers should put them in the right order. Part III contains 20 items. In this part, each item is a short paragraph with one or two questions, and test takers should select the right answer from the 4 options. Part I contains 10 items. For each item, several Chinese words are given and test takers is required to write a sentence with these words. Part II contains 5 items. For each item, a picture and a Chinese word are given and test takers is required to use this word to write a sentence based on the picture. HSK test score report includes listening, reading, writing and total scores. A score of 180 or more represents a pass. 1. Grammar and Vocabulary. At this level, you need to have mastered 1,200 Chinese characters. The vocabulary list for the Level 4 HSK exam is available online, and if you prefer, you can purchase the Level 4-New HSK Vocabulary through Amazon.com. The exam has been reformatted to better test students’ communication skills in daily situations. Flashcards can help you with studying the vocabulary, but there are a few other methods you can also use. Chinesepod is a great language-learning tool that helps you to more efficiently read in Chinese and create new sentences using the sentence structures and vocabulary found in the Level 4 HSK exam. 2. The Listening Portion. On a daily basis, you should focus on the listening materials of HSK mock papers and complete the most exercises that you can. Afterwards, look at your answers to determine why you made mistakes, make a note of them, and then listen to the audio repeatedly until you have no trouble with understanding it. Because the listening portion of the HSK exam is always regarding day-to-day life in China, it is recommended that you use Chinesepod whenever you have time for it. This learning tool will help you improve your listening skills significantly. 3. The Reading Portion. Being able to read Chinese quickly can greatly improve your chances of passing the exam. Using a combination of extensive reading (reading blogs, magazines, essays, etc. on a broad range of topics) and intensive reading (mock papers and language-learning materials) will give you the best advantage. Another option is the Graded Chinese Reader 3, which is an excellent aid to students trying to improve their reading. Chinese TV shows or movies are also helpful, such as《金婚》etc. These complement your studies since you will be able to learn things that aren’t covered in textbooks and hear how native Chinese-speakers converse. Overall, the best way to approach learning Chinese is to take small steps towards your goal of improving your skills. Focus on learning new material on a regular basis and reviewing material you are already comfortable, and you will do better on the exam. 4. The Writing Portion. If you don’t already have a Chinese journal, start one to practice your writing. You can also write essays to utilize the sentence patterns and vocabulary terms you’re learning. Another idea is to compose emails and send them to your Chinese friends and/or teacher, and ask them to correct any incorrect expressions or phrases. You can begin with a short, informal email or essay, and then write more as you improve. 5. Notice the Time. During the fourth through sixth levels of the HSK exam, speed can make a huge difference in your scores. Being able to read Chinese quickly can allow you the time you need to check your answers and be certain you have done your best. When answering questions, it may help to finish the easier ones first before tackling the more difficult ones. However, be sure you don’t miss anything if you choose to use that strategy. Hint: After the listening portion of the test, there will be five minutes for you to answer the questions. However, you will not be given any time after the reading portion of the test, so be sure to answer the questions in the reading portion as you go.